Beyoncé and Jay-Z fans are going wild after a joint tour was announced – and then retracted – leaving fans wondering if it was all an accident, or actually a great guerilla marketing scheme. Facebook event pages and Ticketmaster listings for a Beyoncé and Jay-Z tour popped up all over the internet, leaving fans freaking out, since an official announcement of the tour had not been made. The supposed tour was said to take place on July 30 at Philadelphia’s Lincoln Financial Field, however, the posts were quickly deleted. A fan screenshotted the Ticketmaster listing page immediately and tweeted out a picture of it. Additionally, Complex took a screenshot of the tour listings on Beyonce’s Facebook page before it was scratched as well. Now, fans are left wondering what is actually going on. Could it have been a mistake? Or was this information released and retracted on purpose, just to stir up some excitement in the industry? Ticketmaster and both musical artists have yet to comment. If it was a mistake, somebody probably had a bad day at work over it. If it’s marketing, someone deserves a promotion, because this tour is getting talked about everywhere, and it doesn’t even officially exist yet. The couple last toured together in 2014, and neither has released music of late, so it’s not as if there’s an immediate obvious thing to tour in support of. But as the industry has evolved, touring has come to represent more and more of a revenue-driver for the entire music business, so a straight sequel to their last tour could make sense, financially speaking. Beyoncé already held a 2016 tour in support of Lemonade, so it is unlikely Beyoncé would tour again before releasing new music. 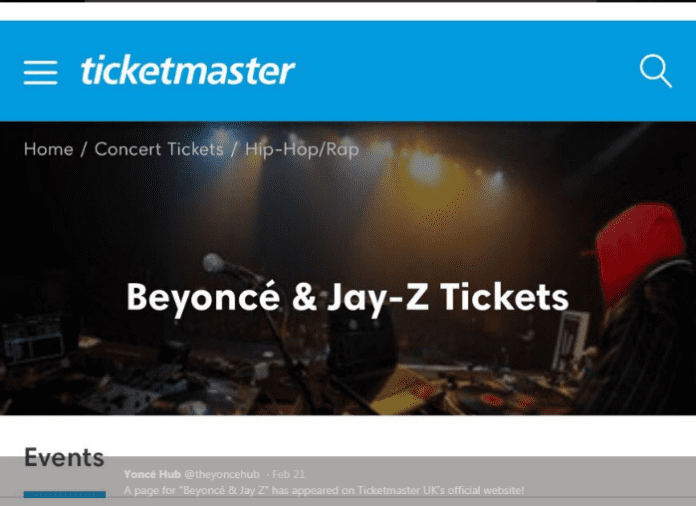 Some fans are skeptical of the rumors as well, proposing that the webpage on Ticketmaster was left over from 2014 – when Beyoncé and Jay-Z did their “On The Run” tour together. For example, Ticketmaster still has a page for boyband One Direction, although the group broke up in 2016. Despite any speculation, Beyoncé has been known to surprise her fans, so, anything is possible.